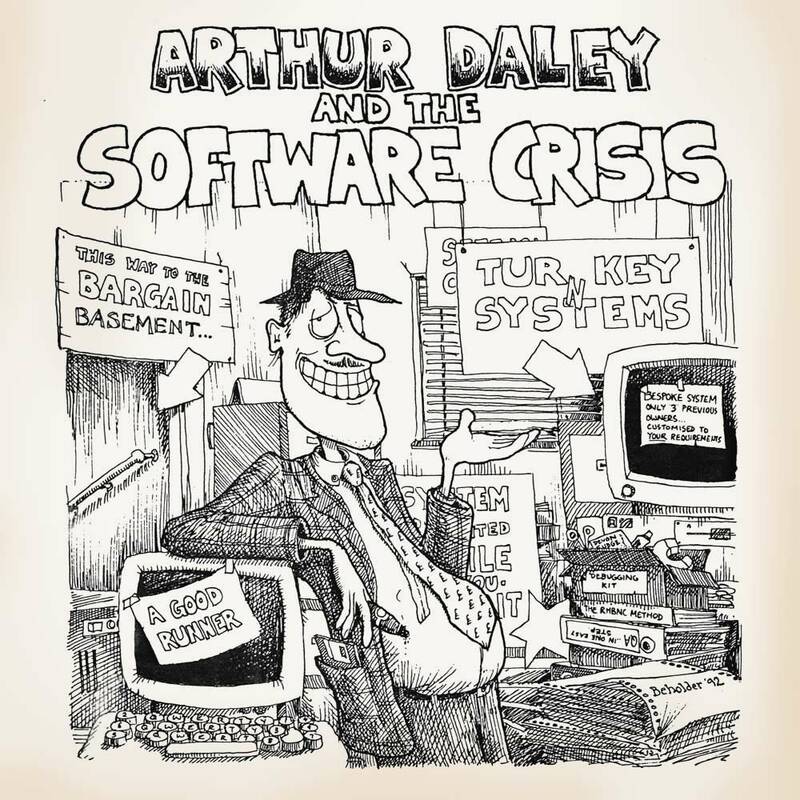 “Arthur Daley and the Software Crisis” poster for 1992 departmental lecture at the Computer Science Department of Royal Holloway, where I was working part-time (it was RHBNC back then). The lecture was delivered by Professor Darrel Ince of the Open University, who provided the title, too — Arthur Daley was a well-known fictitious dodgy-dealing conman from British TV series Minder. Depressingly the issue he was presenting — including but not limited to unfitness-for-purpose and exploitative overpricing in the software industry — continues to be a problem, and is especially painful to see in the public sector. Around two decades after drawing this, I had the misfortune of bumping against near-criminal levels of unprofessionalism being charged out at eye-watering prices to a local UK council who, even if they had known better, were by then contractually incapable of doing anything about it. The company callously hoovering up public money in return for failing to implement something very simple (by which I mean, one very small and well-specified software project) have since rebranded, but I have no reason to believe they will have changed their ways. In that particular case the council eventually — when the contract expired — switched to another big software company... who themselves are notorious for expensive, poorly-executed software projects in the public sector. My former boss Tom Steinberg described this problem with his parable of the million-pound chair (that was 2012, and perhaps things are getting a tiny bit better, but I suspect that’s more to do with budgetary necessity than enlightened decision makers). The “debugging kit” I drew in 1992 appears to contain scissors, a tube of glue, Devon fudge, and a large horseshoe magnet.